Take the time to shop around for the best seats and prices on Broadway tickets in New York City. We guarantee that Applause-Tickets offers the best service for the best possible price in the industry. Call Applause-Tickets today to find out more! If you’re like most shoppers, you would prefer to go to one store and get all of your shopping done. It can be a huge hassle to take the time to visit several different stores and compare prices. At Applause-Tickets, we completely understand that feeling and guarantee that Applause-Tickets is your one stop shop for all things Broadway. 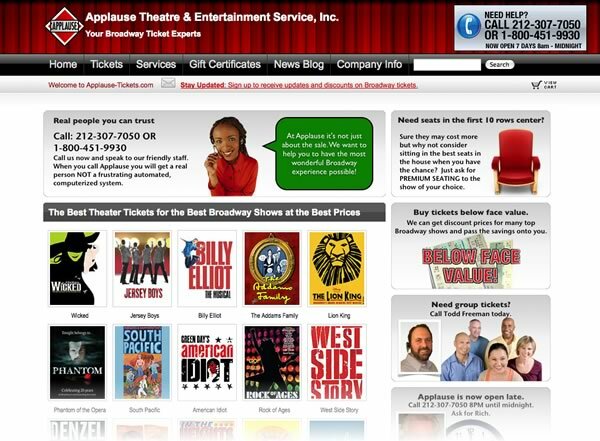 In addition to superior customer care, Applause-Tickets offers the best prices in town on Broadway tickets. But don’t take our word for it. While we know how time consuming it can be to visit several different Broadway websites, we invite you to do just that. We are so proud of our customer service, loyalty, and pricing that we absolutely guarantee that you won’t find this level of quality anywhere else in the industry. Just about anyone can open a website and sell tickets to a Broadway show. Some of our competitors aren’t even based in New York City! Applause-Tickets has been in the industry for over 20 years. Our owners, Rich and Bill are available by phone or email anytime. Our live operators are Broadway experts who live and breathe New York. They have years of industry experience and are absolutely dedicated to helping you find the best seats, best prices, and best scheduling for you and your group. We invite you to do more than look at our website. Picking up the phone and calling our live operators will allow you to have a more personalized Broadway ticket purchasing experience. We also offer help with booking hotels, transportation, and even offer local restaurant recommendations. We promise to take our time with each and every customer. We want to learn your individual tastes so that we can offer informed recommendations for shows before you ever spend a dime. Call Applause-Tickets today at 212-307-7050 or 1-800-451-9930. We guarantee that you won’t be disappointed.